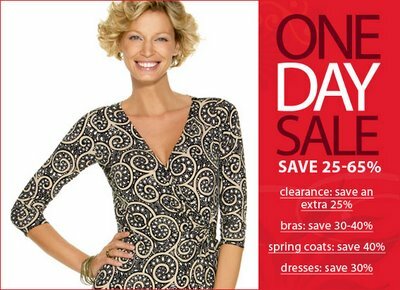 Super weekend savings to be made at the macys.com One Day Fashion Sale on Saturday, February 24, with savings of 10-50% + Values Plus an Extra 25% on Clearance. (Preview day February 23). SAVE 25-65% plus an extra 25% on clearance items! SAVE 30-40% on bras, save 40% on spring coats and 30% on fashion dresses! SAVE 30% plus an extra 25% on sales prices on fashion shoes! SAVE 20-50% plus an extra 20% on sales prices on fashion jewelry! macys.com is the online destination offering quality, value, style and great selections America's favorite fashion brands and designer labels such as CHANEL, Calvin Klein, Tommy Hilfiger, Sean John, Clinique, Vera Wang, Lenox, All-Clad, Lancome, Ecko, Donna Karan, Krups, Waterford, JLO by Jennifer Lopez, MAC, Estee Lauder, Ralph Lauren, Puma, Cuisinart, Wedgwood, Villeroy & Boch, Nike, KitchenAid, and our exclusive brands INC International Concepts, Charter Club, Tools of the Trade and Hotel.